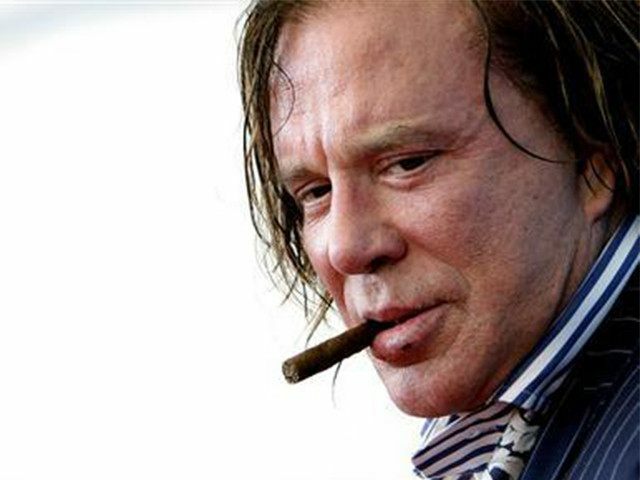 Actor Mickey Rourke unloaded on Donald Trump in an expletive-filled rant Wednesday night, calling the GOP presidential frontrunner “the biggest scumbag on the planet” whose wife, Melania, is “one of the biggest golddiggers around” — while threatening to beat the candidate with a baseball bat. “Before I throw this first pitch out, I just want to say — the biggest scumbag on the planet is that maggot with an ‘f’ in front of it, Donald Trump,” the 63-year-old action star told TMZ while playing a game of catch with a friend in Beverly Hills Wednesday night. The former boxer-turned-movie star told TMZ that Trump had sued him and the rapper 2Pac several years ago, though it was unclear what he had allegedly been sued for. Rourke has mostly kept a low profile since he returned to boxing in November 2014, when he fought and defeated 29-year-old Elliott Seymour in a bout in Russia. Seymour later alleged that he was paid $15,000 to throw that fight. Rourke’s threats against Trump came just a few days after the rapper Everlast similarly threatened physical violence against the candidate. The comments come as violent rhetoric against Trump has intensified in recent months. In March, Comedy Central host Larry Wilmore joked about suffocating the candidate with “the pillow they used to kill Scalia,” and just a few days before that, comedian George Lopez tweeted a graphic illustration of drug lord El Chapo Guzman holding Trump’s severed head atop a pile of skulls. Earlier this month, rappers YG and Nipsey Hustle released a new song called “FDT (F*ck Donald Trump),” in which the pair make various threats against the candidate.